Malaysia is rapidly emerging as South-East Asia's latest golfing haven. Almost 200 golf courses are currently available around the country. 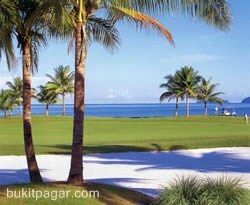 Malaysia has bloomed as the ideal destination for combining a memorable holiday with an exciting game of golf. 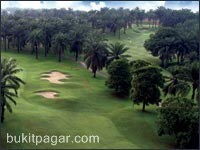 2) the Saujana Golf & Country Club. Both of the golf courses offer the very best in luxury. The first one is part of the magnificent Mines Resort City (also a shopping centre with a canal and a theme park called "Mines Wonderland"). It's known as one of the 'Seven Wonders of Malaysia' and the golf course is situated around a lake, which used to be the world's largest open cast tin mine. Situated less than half an hour from the centre of Kuala Lumpur and just over 30 minutes from Kuala Lumpur International Airport, the Mines Resort Golf & Country Club course was designed by Robert Trent Jones. It earned exposure all over the globe in 1999 when staging the World Cup of Golf - Tiger Woods and Mark O'Meara lifted the title for the United States - and has since hosted the Malaysian Open. The Saujana Golf & Country Club is another gem, this particular one having been designed by Ronald Fream. Just 37 minutes from the Internal Airport KLIA. 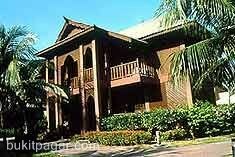 The historical city of Malacca, two hours from KL, has the A'Famosa Golf Resort. It's a family-orientated holiday destination that features 27 holes, a water world, safari park and the bizarre cowboy town, which comes alive at night. The three nines, Rockies, Palm and Crocodile, are all well designed, set against boulders, palms and clear waterways. The island of Langkawi lies off the northwest of West-Malaysia. It's a 55-minute flight from Kuala Lumpur. In the 1980s the island had just one hotel, relying on fishing and rubber production, before being developed as a tourist attraction on inspiration by the former prime minister Mahathir. Today there are 10 000 hotel rooms and three golf courses and the airport receives direct flights from London to make it Malaysia's most popular holiday destination. 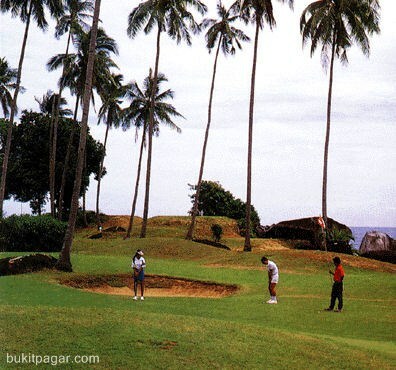 The Golf Club Datai Bay on Langkawi is carved out of the jungle in the foothills of the Gunung Matchincang mountain range, along the coastline of the turquoise Andaman sea. The course is short at 5 994 metres but is extremely tight with the forest collecting anything remotely off line. I would be hesitant to look for anything or anyone in there. Monkeys and monitor lizards frequent the course and players are warned not to leave objects of value in their golf carts. The club has a unique extra hole, the 19th, a par 3 built on the water. * Applies only if accompanied by member otherwise walk-in rates apply. THE MANAGEMENT RESERVES THE RIGHT TO VARY THE RATES WITHOUT PRIOR NOTICE. 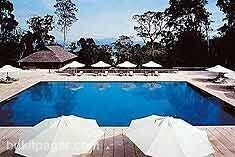 The Berjaya Tioman Beach Resort, part of the Best Western Hotels chain, is located on beautiful Tioman Island. The island's only international standard hotel is set on 200 acres, and boasts its own 18-hole international championship golf course. Designed using typical Malay architecture, the breathtaking Berjaya Tioman Resort maintains the highest standards of both appearance and service. Set on one of the most scenic islands in Malaysia, with palm-fringed beaches, crystal clear water, and colorful marine life, the Berjaya Tioman Beach Resort also offers many facilities including a very well equipped water sports center. Beautifully integrated into the lush surroundings of the tropical rainforest, each experience at The Spa at the The Datai promises to be special. Select from a comprehensive menu of exquisite spa treatments by expert and nurturing hands, to relax, rejuvenate and revitalize for a sense of overall well being. Signature treatments include The Datai massage, Balinese Massage, Warm Stone Massage, and Rainforest Harmony. Individual and couple spa sessions are available in 4 enchanting spa pavilions. The Datai Bay golf course enjoys a unique setting in the heart of the rainforest, between the magnificent Machincang Mountain range and the Andaman Sea. Renowned as one of the regions most exclusive 18-hole golf courses, the facility is perfect for golf enthusiasts.